I have a question about the queen. Why does she carry a purse? It's not just "What do you need a purse for when you're ceremonially reviewing the guard?" It's also "You can be the Queen of England and still have no one to bear the burden of your wallet, comb and keys?" 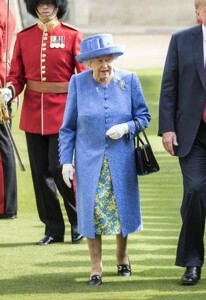 Moreover, "You can be the Queen of England and still not have sufficient pockets?" Plus "Oh wait what does the Queen of England need a wallet for?" Probably the right question is "Is this a fashion thing?" Yes, you're probably thinking she has a can of mace and a pearl-handled pistol in her bag for this particular occasion, but that's not my point. I'm also, upon reflection, a bit befuddled that she'd wear uncomfortable shoes, as the Queen of England, and somewhat agéd, but that's almost surely a fashion thing. The white gloves too. Just lady luggage--- it's too weird. She has the power. She could change expectations. "What's in her purse?" is a whole other line of wondering. Probably nothing. I vote nothing.